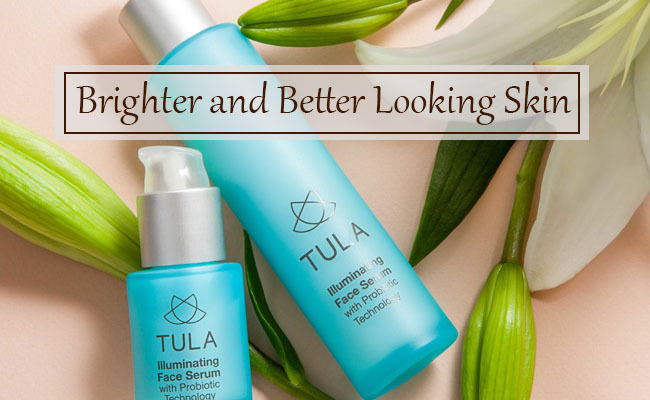 What is the Tula Probiotic Skin Care Illuminating Face Serum? Why is its formula so effective? What are the secrets when using it? What do we like a lot about it? What we don’t like at all? Do we have a conclusion? Getting to younger, brighter and healthier looking skin isn’t something to happen overnight and not only you need patience, time or money to get it, but you also need just the right cosmetic products for it. You can get online, ask around or simply gather all the info you need for making a decision. You can try various skin care products in time and see for yourself which works the best for you. Or you can do none of the above and simply try a reliable and naturally formulated skin care product that leaves your skin radiant and brighter. The Tula Probiotic Illuminating Face Serum is based on brightening ingredients that offer antioxidant protection, illuminating the skin. Made with retinol, antioxidants, probiotics and nutripeptides from hydrolyzed rice, the serum stands out with its hydrating anti-aging ability, leaving your skin brighter and your skin tone clearer. The serum is made to reduce dark spots, dullness and fine lines from skin, leaving your skin younger and more radiant. It also increases the moisture retention ability of your skin, boosting the brightness and health of your skin. Hydrating and efficient, the serum is made only with the fine ingredients and you shouldn’t skip it from your daily skincare routine. Apart from the fact that the formula is free from mineral oil, parabens, petrolatum, propylene glycol and phthalates, the numerous ingredients increase and explain its overall efficiency and value. Here’s a closer look at some of the most important ones. Milk protein-increases the absorption and has no toxin hazards. It sooths an irritated and dry skin and seals in the moisture of skin. It hydrates the skin and is safe for the sensitive skin. It heals the damaged skin and gives it the nutrients it needs. Hydrolyzed rice protein-moisturizes the skin and calms the irritated skin. It increases the elasticity of skin and smooths out the fine lines. It’s also naturally gluten-free. Yoghurt extract- keeps your skin healthy and protected from the outer aggressors. It sustains the skin renewal process and balances moisture in skin as it contains lactic acid. It softens the skin and gives it a healthy glow. Bifida Ferment Lysate-repairs the damage made by the UVs to the skin. It calms and hydrates your skin. Camelina sativa seed oil-reduces inflammation of skin and minimizes redness, itchiness and chafing of skin. It works in eczema and psoriasis and creates a healthy barrier for skin to protect it from the outer stressors. It fights against the UVs and slows down aging of skin. Turmeric root extract-speeds up the healing of skin and reduces redness or bruising. It corrects an oily skin and protects the skin from the sun’s damage. It has anti-aging properties and minimizes the risk for skin cancer. It sooths symptoms of various chronic skin conditions, eczema, rosacea and psoriasis including. Safflower seed oil-reduces roughness and dryness of skin, removing impurities, dirt and excess oil. It calms the symptoms in eczema, psoriasis and keeps acne at bay too. It increases the elasticity of skin and hydrates the skin. Blueberry fruit extract- contains high concentration of Vitamin C and keeps the sun’s damage against the skin under control. It also fights against the skin cancer and slows down the aging process. Its antioxidant properties make it efficient for keeping the action of stressors at bay. On top of everything else, the serum has never been tested on animals. In order to get best results, you should apply the serum on your cleansed and dry skin, daily. Pay attention to your skin and decide for yourself if you should apply it both AM and PM or just once a day. You only need a bit of the serum as a little goes a long way. Use gentle moves for evenly distribute the serum on face. Let it dry completely and follow it with your typical moisturizer. The serum has a great smell that doesn’t linger for long, though. It improves the skin’s texture and reduces the visibility of acne, dark spots, scars and redness. Smoothing and clearing the skin, the serum brightens your skin and improves your skin complexion. The serum doesn’t stand out with just its efficiency, but also with its impressively long list of ingredients. Yes, we definitely do have one. As the formula is loaded with natural ingredients that have so many benefits for the skin, the serum manages to be a safe choice, whenever in need for improving your skin’s texture and complexion. How much are you willing to pay for better, younger and healthier looking skin? Recent reviews on Sugar & Fluff Beauty: the Tata Harper Resurfacing Mask, the Ogee Jojoba Restore Face Oil, the CLEARstem Acne Scar Removal Serum, the Tata Harper Rejuvenating Serum, the Tata Harper Regenerating Cleanser Review.